The PSP LCD was the hot new tech when Sony first released the handheld system. Now this type of LCD is widely and cheaply available to anyone and learning how to interface and display on the LCD becomes crucial. 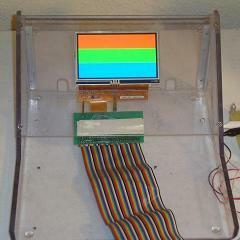 This tutorial uses an FPGA to interface with the PSP LCD. Could you tell me how you powered the backlight? I noticed the pcb you used to connect the display wasn’t in your parts list. I’m doing a similar project but I can’t figure out how to meet the backlight’s high voltage requirements. Any help would be much appreciated. Thanks in advance.